Reading The Drops of God is like drinking a good table wine: the flavor may not be as complex as a finely aged varietal, but it goes down easily, leaving a pleasant aftertaste of melodrama, intrigue, and romance. Like Oishinbo, the manga it most closely resembles, The Drops of God revolves around a slightly preposterous contest between a father and son. Kanazaki Yutaka, a revered wine critic, dies unexpectedly, leaving behind a will that’s a much a gauntlet as it is a set of instructions for his son: Shizuku will inherit Yutaka’s wine collection, but only if Shizuku can identify the thirteen different wines mentioned in his father’s will. To complete his task, Shizuku must overcome several serious handicaps, not the least of which is his own lack of experience buying and drinking wine. (At the start of the series, Shizuku is a junior sales executive at a beer distributor, proudly eschewing wine for ale.) Adding special urgency to his quest is a rival, Tomine Issei, a handsome young wine critic who was adopted by Shizuku’s father. If Issei successfully names the “Twelve Apostles” and the “Drops of God” before Shizuku, Issei will inherit the entire collection. Also disappointing is the portrayal of Shizuku’s partner-in-wine-tasting, Miyabi Shinohara, an aspiring sommelier. Though other characters praise Miyabi for her book knowledge of wine, she rarely has an opportunity to shine in her role as the expert on viniculture; Miyabi’s primary function is to recite each wine’s provenance in detail, allowing Shizuku the more entertaining role of waxing poetic about the wine’s flavor. Throughout volumes one and two, Shizuku frequently upstages Miyabi, even when Miyabi’s professional experience ought to afford her greater insight into an appropriate wine-food pairing, or lead her towards an inexpensive but sophisticated French import. Yet for all the creaky plot mechanics and broad-brush characterizations, The Drops of God proves surprisingly fun, thanks to the author’s imaginative attempts to describe the flavor of particular wines. Early in volume one, for example, one character likens a a 2001 Chateau Mont-Perac to Freddie Mercury’s singing—an odd but inspired choice, as Mercury’s voice is one of the most distinctive rock-n-roll sounds of the last forty years, a piercing, operatic instrument that’s immediately recognizable, even to the untrained ear. The fact that the artist’s rendering of Mercury looks nothing like him is beside the point; the comparison alone is enough to instill in the reader a sense of how visceral and distinctive the Mont-Perac’s flavor is. The other thing that prevents The Drops of God from sinking under the weight of hackneyed story elements are the supporting characters. Tadashi Agi (actually a pseudonym for the brother-sister writing team of Shin and Yuko Kibayashi) populates the story with mustache-twirling villains, oddball oenophiles, and opinionated co-workers, each of whom leaves a vivid impression. One of the most appealing is Chosuke Honma, a member of the Wine Division at Taiyo Beer. Though drawn in bold strokes, Chosuke seems like a real person — a wine enthusiast who firmly believes that Italy, not France, produces the world’s best wines, and who frequently bursts into song. (His tune of choice: “O sole mio,” of course!) Chosuke’s passion, temper, and obsession with Italian culture — not to mention his receding hairline — make him a great foil for the ridiculously perfect Shizuku, whose movie-star looks, charming personality, and superior ability to identify great wines make him more a fantasy figure than a real character. Artistically, The Drops of God is a feast for the eyes. Shu Okimoto’s characters are beautifully rendered, making the numerous scenes of characters discussing wine something to savor, rather than something to be endured. Okimoto also does a terrific job of translating terroir into imagery, transporting the reader from Japan to Europe with crisp, evocative drawings of French vineyards; the reader can practically smell the soil and the ripening fruit. Most importantly, Okimoto finds creative ways to suggest the complexity of a good wine, using vivid imagery — a field of sunflowers, a masquerade party — to suggest how the “nose” of a wine sparks strong associations with events, places, and people. 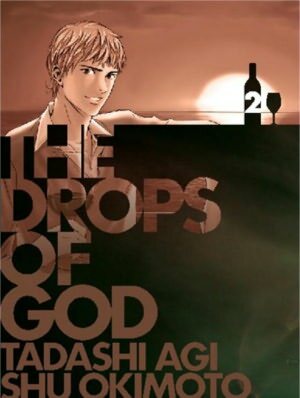 Long-time manga readers won’t be surprised to learn that The Drops of God is an entertaining way to learn about wine; as titles such as Oishinbo and Not Love But Delicious Foods Make Me So Happy! demonstrate, a skilled writer can fold a considerable amount of educational detail into a story without reducing it to a textbook. Manga newbies or readers looking for a good introduction to wine terminology will find Drops a revelation, however, as it imparts highly specialized information with the same natural ease that Law & Order illustrates the inner workings of a crime investigation, while at the same time functioning as a fun soap opera; even if the reader isn’t the least bit interested in wine, Shizuku’s quest for the “Drops of God” is an irresistible hook. Highly recommended. THE DROPS OF GOD, VOLS. 1-2 • WRITTEN BY TADASHI AGI, ILLUSTRATED BY SHU OKIMOTO • VERTICAL, INC.
I’m surprised at how much I enjoy manga about alcohol, when I myself don’t even drink, and never will. You’d think that my lack of interest in the topic would drive me away from the manga. Just goes to show what a good writer can do with literally any topic. Also, am I the only person who thinks Shizuku looks far too much like Light to really be comfortable around him? Hah! I never noticed the Light-Shizuku resemblance, but now that you mention it, they do look like brothers, don’t they? Almost identical really. Heck, the hair is what makes them look most similar to me, but there’s something about the face too. Maybe they go to the same barber? I read all this I have found available for this manga, and I must say, I had no idea there was so much to wine. Gods Drops and stories that teach and leave the reader with a greater appreciation for the topic are my favorite. I have a special fondness for food and manga wine, too! I found Oishinbo very entertaining and educational, especially the volumes that focused on everyday Japanese foods. I think my favorite volume was the one that explored pub cuisine, a topic about which I knew absolutely nothing before I read it.